The demo session will be on Thursday, October 28th, between 12:35 and 14:30 in room Darwin. See [the agenda]. The demo room will be available starting at 8:00 pm for demo setup. "Seeing is believing!" Unlike in Desktop or Server applications of Linux, in embedded systems Linux technology is usually unseen. Although it is a challenge, we want to expose Linux software and techniques so that other developers who are interested in this technology can learn, and become potential contributors themselves. We hope that through opening up technical details and projects (in the way of Open Source development), these demonstrations will provide insights that are helpful to developers. 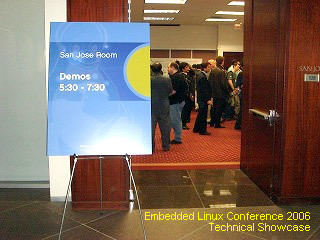 The Embedded Linux Conference Europe should not be used for a pure sales pitch. You can show off a product, if there are features or aspects of the product you are displaying that are open source. Demonstrations should be of software that is available under GPL or LGPL compatible licenses. Please replace (a) to "@" and (dot) to "." If you need special arrangements, please contact the coordinator. Assuming the power is less than 750W. If your demonstration will exceed that, please consult the coordinator. A large-format printed poster, based on the file you submit. Please note that a dedicated (wired) Internet connection will NOT be prepared. However, wireless Internet may be available via the hotel wireless network. We cannot, however, guarantee Internet access. Please refer to the attached photo. All demonstrators are requested to prepare a poster to explain the technical outline of the demonstration. You can download the template from this page. CELF will print them out on large size paper. The document should be sent to the coordinator by October 11th. Caution: Do not change the paper size. It is intentionally set to a big size. You can also put some flyers there for people to grab, if you'd like. If you can put charts and graphs on the poster, that's nice but it is NOT required. 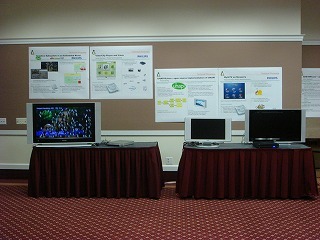 Neither the poster nor the hardware (if any) needs to be elaborate or require lots of setup. One year I showed up with a camcorder and just talked to people about it's bootup time (which I had worked on). If you are a presenter, the demo session is a good chance to talk to people one-on-one about your session topic. This gives you more time for interactive Q&A, and a chance to show something hands-on, if that applies to your subject. The contact person, the company name or the project name, the outline of the demonstration. The coordinator will acknowledge your application by e-mail. Prepare the poster and send the data to CELF Office and the demonstration coordinator by October 11th. It will be printed out by the conference organizers on big size paper. You can bring the equipment yourself, or ship it. Q: Is this opportunity limited to CELF members? A: No. 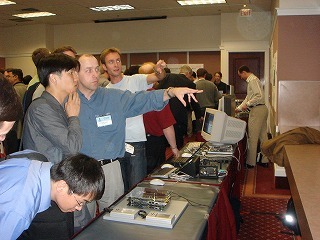 You do not have to be a forum member to have a demo at the conference. However, each demo should be associated with a paid conference attendee. Q: Is the demonstrator required to make a presentation at the conference? A: No, this is not required. However, we believe there will be many people who will to be interested in details of the technology, so we hope that you can have a session. Please note that the due date for a session proposal is earlier than the due date for demo sign-up. Q: Should I assign some dedicated staff to carry on the demonstration? A: No, this is not necessary. There will be a dedicated time slot for the demos that will be separate from the other technical sessions. So there should be no conflict between the demo session and the other technical sessions. Q: Is there any fee to demo something in this session? A: No, it is completely free. However, the session is limited to conference attendees, so please register for the conference if you would not otherwise do so. If you have someone coming who will ONLY run or assist with your demo, and not attend any sessions, then that person may be admitted for free, for just the demo session (and setup and take down). 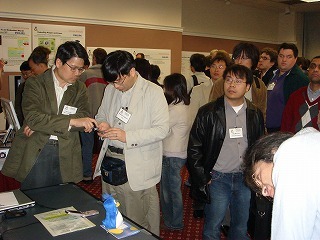 However, each demo should be associated with at least one registered attendee. This page was last edited on 11 May 2011, at 07:34.